These extracts are courtesy of Jim Anderson, taken from the material he put together to record the 50th Anniversary of the club in 2007. The Edinburgh Corporation of the 1930’s introduced “Pay-as-you-Play” golf for the people of Edinburgh, and became one of only a few towns in Scotland to provide such a facility for their citizens. On the 4th May 1938 the Lord Provost Sir Louis Gumley cut the first sod of the then Broomfield Estate. At that time the name Silverknowes was yet to appear, and it was possible that it may well have become known as Broomfield Golf Course! Broomfield House (which became the Stakis, Commodore and Globetrotter Hotel) had been converted from an old Nursing home to include lockers for men and ladies. It was planned as an 18-hole course, but only 9 holes had been completed by the autumn of 1939 with the war interrupting progress. The house and grounds were to be developed later as a Clubhouse along with the remaining 9 holes. The architect was a Mr. P. Mackenzie Ross who had already laid out a number of courses in Europe, and this was his first venture in Scotland. 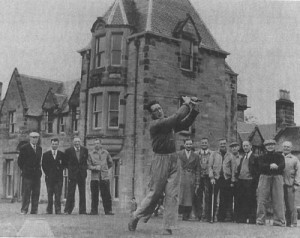 Though still only 9-holes an exhibition match was arranged for the re-opening of the course on Wednesday 23rd May 1956. This involved a challenge match between Mr. David Houston, Senior Professional and Mr. George Yuille – whom he’d intended to install as his assistant. A showroom and workshop was planned in addition to lounges for players. Within a couple of years membership had risen to 150, and soon new premises would be required for changing facilities, which came in the form of a let at Silverknowe House, owned by the City Council. This was situated at the side and back of the present 13th tee. “ There was submitted a report dated 23rd July 1957, by the City Chamberlain, regarding the rent to be fixed for the Annexe at Silverknowe House to be accepted by S.G.C. pending the provision of facilities at Silverknowe House. The Sub-Committee resolved to recommend the rent is fixed at £10 per Annum ”. Under somewhat mysterious circumstances Silverknowe House burned down, and the search was on again to find suitable changing facilities. Edinburgh District Council allowed us the use of a single room above the present-day Starter’s box, which was affectionately christened “The Howff”. This was where the heart of the Club was born as the premises became a more intimate meeting place for social gatherings, acquiring ‘19th hole’ status. Gaining membership was easy and numbers grew steadily, so it soon became time to consider the need for expansion. The general Social Club scene was thriving in the mid ‘60’s, and brewers were falling over themselves to offer loans for modernisation purposes – as long as we stocked their beer. During 1968/69 moves were made to arrange the planning and building of our very own Social Club premises. We had already become the first club in Scotland to have a £100 weekly Tote prize, and our funds were becoming more and more adequate. At this point, the dedication and involvement of Stewart O’Brien cannot be underestimated. In consultation with architects Arnott, Weatherhead, McVicars and Smith, and Builders J. Dennis of Dalkeith, he overcame the many pitfalls involved and organised the work to start in December 1971. The Contractors were paid an estimated total cost of £30,000, via prudent internal house keeping’. Lord Provost Angus McBean officially opened the Clubhouse in June 1973. A Letter of Complaint is sent to Edinburgh District Council: Stray dogs are fouling the fairways. Treasurer reported income of £1.0.6d from sale of old golf balls! The Supper Dance Raffle in Wardie Masonic Hall – included a pair of Nylons bought by the Social Committee. The Raffle itself made a profit of £15! But after all expenses were deducted – the overall profit was only £2.12 shillings! A certain Mr. W. Trotter had been seriously ill, in hospital for a very long time. The Committee sent him 100 cigarettes – and a GET WELL SOON card! A full-time Barman started on £14 a week. A member complained about the serving of food on a Sunday. The Steward was granted his plea for 7 days holiday – providing his wife could cover his shifts. After five complaints of rowdiness a notice was posted on the board to condemn the habit of heavy drinking and excessive bad language! First argument raised to vacate “Howff” and apply for permission for our own premises. Price of Beer goes up 2d. – (1p) Having been frozen for 4 years. Tote double initiated – first club in Scotland to pay out £100 weekly. One of the Social Committee’s acts this year was – COBBLERS! Reviewing a letter threatening resignation from the Steward and his wife (because of constant overwork and long hours), the committee agreed to employ a separate cleaning lady. This would free up his wife to relieve him at the Bar!